Make Feminism A Threat Again. This small city card was found at the front counter of a music store and tattoo parlor in Vienna called Rattlesnake. The back of the card lists events sponsored by local autonomous antifascists whose mission is to examine the relationship between gender and capitalism. The first event on February 21, 2017, at Vienna’s Antifa Café is a lecture and discussion about the feminist critique of identity politics. 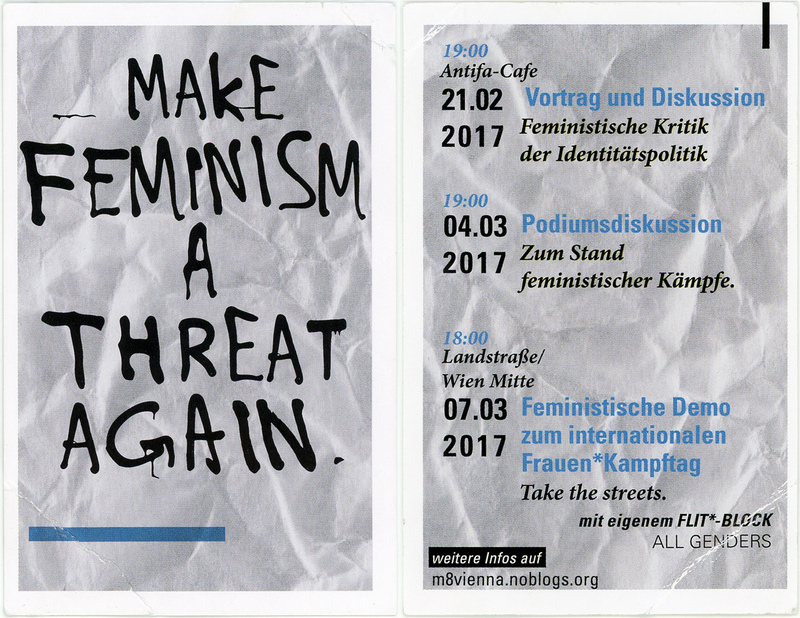 The second event on March 4, 2017, is a podium discussion about the feminist struggle, and the third event on March 7, 2017, in central Vienna is a demonstration, or “Demo,” in the name of women's rights. These events all led up to the annual celebration of International Women’s Day on March 8.